Last week marked the release of Battleborn, the most ambitious game to emerge from Gearbox Software to date. The Borderlands alums are switching gears to test their mettle in the multiplayer online battle arena, a genre that has seen enormous success in the competitive gaming scene in the past few years. Their stab at this latest trend straddles the line between two wildly popular types of videogame, with a team shooter based Story Mode offering a bridge to hesitant would-be MOBA players. The question is, does it succeed? Battleborn offers a meaty roster of 25 “heroes,” each a refugee from a disaster that destroyed most of the stars in the universe. Gathered on Solus, they band together as the Battleborn to take down the Varelsi, the sinister force responsible for the destruction. Gameplay is divided into three team battle modes, Meltdown, Incursion, and Devastation, and a cooperative campaign Story Mode, consisting of roughly half-hour matches or missions. Players gain experience to progress on a double helix tree of ten skills that reset with each match, choosing between two special powers (called Augments) with each level. As the player traverses the map, crystal shards are gathered to spend as currency on environmental traps, helper drones, and upgrades, as well as to activate the player’s gear, a set of three special items that offer various boosts while in combat. Attacks range from melee to long range tactics as well as area of effect and magic based powers. New heroes, outfits and Mutations, offering a third option in the Augment skill tree, open up as experience is gained, and with each level players also get rankings that track the overall progress of the character. I like Battleborn for the same reason I hate it: it has the stink of Borderlands all over it. From the voice actors, to the art, level design, UI, HUD, cut scenes, and even some of the iconography, the similarities abound. Story Mode feels less like a brand new game and more like playing through a Borderlands 2 mission, right down to the environment modeling and map structures. If future updates to the game were to add Borderlands cast members to the hero roster, they’d fit right in without missing a beat. In fact if you’d told me the game has originally been designed as a crossover turning the Borderlands series into a MOBA, I’d have a hard time not believing you. Nonetheless everything that made Borderlands fun is here too. 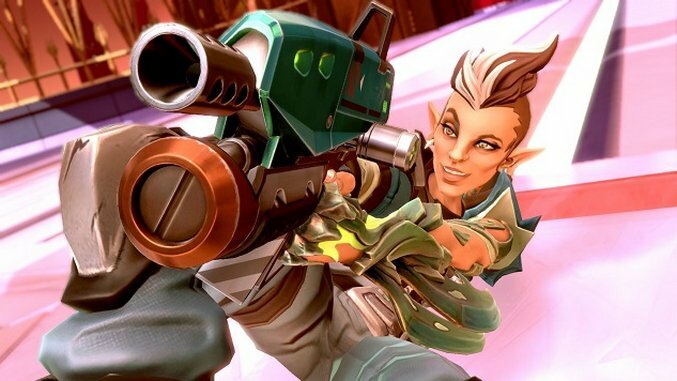 If you’re good at Borderlands, chances are you’ll be good at Battleborn. It has a diverse cast with a creative range of skills and tactics that keep multiple play-throughs interesting. It encourages strategic coordination with your team to cover an entire spectrum of strengths and weaknesses to pursue the ultimate balance. And despite the necessary repetition of grinding through constant mission replays, it maintains a satisfying sense of progression through the player’s leveling and stat systems. Personally I’m fonder of the campaign mode than I am the others, as I’m not much of a MOBA fan. The pacing tends to be over-stimulating for me. However the competitive modes are still a lot of fun to play. Those who aren’t hooked by the traditional fantasy aesthetic of games like DOTA 2 and League of Legends will appreciate this lighter take on the MOBA genre, and I predict at least something of a competitive community will form around it. Story Mode is a little disappointing in that the missions aren’t offered sequentially, and between that and the high speed pace of each narrative chapter, it can be difficult to get a grip on the actual story behind the mode. Is the premise even worth paying attention to through all the chaos? Hard to say. It is, after all, meant to tie together a wacky mongrel cast of characters that would otherwise not exist in the same universe. Each mission, however, does do a good job of changing up the objectives from chapter to chapter, which helps break up the stale gameplay. Sadly, unlike Borderlands, the game lacks aesthetic cohesiveness. Science fiction in general seems to suffer from this problem. A lot of artists have a tough time trying to predict the evolutionary path that future fashion will take, and the end result of their labor is often uniform, bland and speckled with gaudy and needless embellishment. By trying to move beyond the past, they rob the audience of a subtext otherwise conveyed by primal associations. In other words, it’s tough to find a relatable anchor without relying on familiar imagery. And because the game attempts to tie together such a random assortment of heroes, each are so different from one another that you cannot get a grip on the game’s actual identity. It compromises the player’s interest. That being said, the opening and cut sequences of the game, animated pieces that evoke memories of Heavy Metal and Gorillaz music videos, feature the strongest artistic direction in the game. I wish there were more of it. I’d have happily played an entire game that looks just like it. The graphics and environments are also a vast upgrade on the Borderlands series and the improved modeling is much easier on the eyes. Among the heroes strong attention has been paid to the traditional character classes and archetypes that fans of RPGs, MOBAs and team-based co-op shooters are familiar with, and there’s something for just about everybody. Personally I’m a sniper/archery focused player and I have great close range skills with bows and sniper rifles, so I’ve been playing as Thorn. The fluidity and speed of the gameplay is immensely satisfying once you become comfortable and memorize the skills and controls. My review of Battleborn was delayed so that I could get a chance to test the game’s performance on the general servers, as well as try out more of the Story Mode and the competitive modes not available in the Beta or Early Access Preview. In the course of a dozen matches, I was disconnected twice. I found that frustrating, as my player stats have become something of an obsession. Wait times, however, have been short, and the community welcoming. 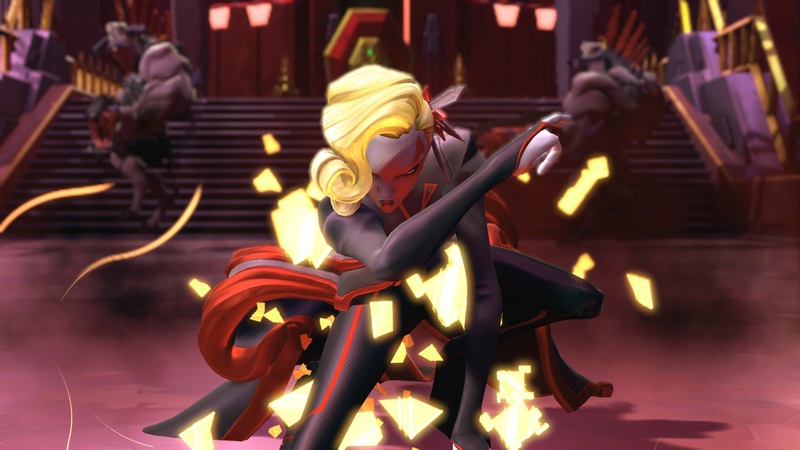 Battleborn is a lot of fun but how popular it will be remains to be seen. Releasing it during roughly the same window as DOOM and Overwatch was poor timing on their part. I plan to keep playing it, but given the game’s retreading of Borderlands with an added MOBA spin, I don’t expect my friends to join me. Battleborn was developed by Gearbox Software and published by 2K Games. It is available for the Playstation 4, Xbox One and PC.